A senior North Korean official says that Pyongyang is willing to hold talks with the United States. Presidential spokesman Kim Eui-kyeom said that Kim Yong-chol, the chief of a high-level North Korean delegation to the PyeongChang Winter Olympics' closing ceremony, made the remarks during a meeting with President Moon Jae-in on Sunday. The top office said that President Moon met with the eight-member delegation at an unknown location in Pyeongchang at 5 p.m. In the one-hour meeting, the president said that dialogue between the U.S. and North Korea should be held at an early date to help improve inter-Korean relations and realize a fundamental resolution of the issues of the Korean Peninsula. 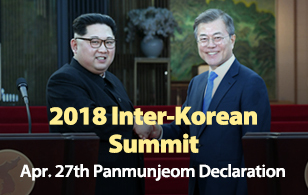 In response, the North's chief delegate agreed that North Korea-U.S. relations must develop along with the South-North Korea relationship, saying that Pyongyang has willingness to have talks with the U.S.